Not long ago researchers at Yale cast a pall over the use of complementary medicine in the care of cancer patients – a.k.a. “integrative oncology.” The negativity was based on a fundamental misclassification. Nevertheless, the wrong-headed results prompted a flurry of news accounts that suggested the users of complementary medicine “die earlier than those who didn’t.” A more expansive and deeper look at the potential values of integrative oncology can be gained via a recent Special Focus Issue on Integrative Oncology with its 6 invited reviews, 13 original research articles, 7 commentaries, and 2 editorials. The submissions came from 4 continents. The issue was co-edited by Israeli integrative oncologist Moshe Frenkel, MD, who formerly led integrative oncology at MD Anderson, and Lynda Balneaves, RN, PhD, the current president of the Society for Integrative Oncology and published by JACM-Paradigm, Practice and Policy Advancing Integrative Health (The Journal of Complementary and Alternative Medicine). I serve as the editor-in-chief of JACM and worked closely with Frenkel and Balneaves over the course of a year, sorting through nearly 70 submissions in selecting what became a double issue. 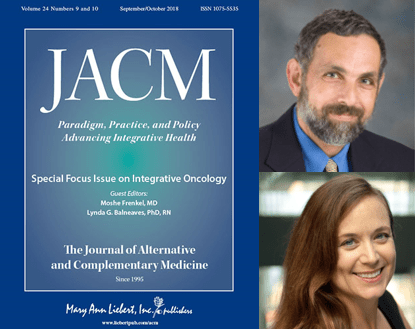 As the co-editors note, the JACM Special Issue was initially developed around a concept of Frenkel’s that JACM provide scientifically-grounded information that would err on the side of practicality for the oncology clinicians. The six experts selected – Frenkel was one of them – wedded academic affiliation with integrative oncology clinical expertise. Either alone or with teams, these authors anchored the issue with these papers meant for clinicians. All are open access to the public until October 24, 2018. The invited authors are noted in this list. Yet if judgement is to be made about the future of integrative oncology, where the rubber meets the road is in the original research. The issue includes a heterogenous set of 13 papers. One explores the effectiveness of a self-care tool-kit for breast cancer patients in a military environment. Such efforts to reduce adverse effects of oncology treatment are a main theme of papers: an Italian real world analysis of a hospital-based integrative oncology program; yoga for women with fatigue following breast cancer treatment; healing touch and massage for cancer pain; another on therapies to limit insomnia, and more. Two are related to dietary supplement use, one in a major US hospital, the other in a Japanese environment. Another examines integrative strategies for oncology caregivers. Two studies, from Mayo Clinic researchers, document the still shoddy level communication between oncologists and their patients about the vast use of complementary medicine usage. In the short term, the JACM Special Issue on Integrative Oncology in no way undoes the damage in the public mind from the fallacious JAMA Oncology article noted at the top of this column. Yet in the midst of the ignorance-based misclassification of the Yale researchers and the media that trumpeted their story, the issue offers the brick-by-brick, additive steps for change through which integrative oncology is becoming the standard oncology care. In the title of their opening editorial, Frenkel and Balneaves call out the emerging model, supported by the evidence in this issue: Integrative Oncology: An Essential Feature of High-Quality Cancer Care.